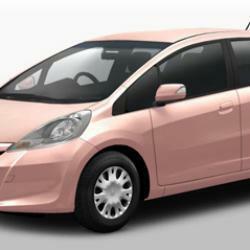 The Honda Fit She's: Pink is nice, but here's what women really want. First there were the Bic pens “For Her”—special writing instruments designed to fit my special lady-hands. Now Honda, recognizing that the woman driver has needs unique needs too, is rolling out the Fit She’s in Japan. While these products are a good start toward feeding the female consumer’s considerable buying power, I’m not sure companies are going far enough to meet the very, very specific needs of today’s on-the-go gal. The girliest thing about the Fit She’s is that it’s pink, a color that doesn’t actually do much for those of us who are red-heads, either by birth or choice. Bic’s For Her pens at least came in hues that nodded to the fact that some of our complexions are better matched to ball point pens in a nice soft lavender, powder blue, or sassy turquoise. Ideally, I’d be able to change the color of my new ride by pushing a lady-sized button on my lady-sized key so I could match my car to my outfit on a daily basis. Or to my mood, which changes a lot. But in a world where I still can’t get the perfect opaque red lipstick, I recognize that might be asking a bit much. Beyond that glaring oversight, color coordination isn’t the only thing I want out of a car. Where’s the emergency kit in the trunk that comes fully equipped with an extra set of birth control pills, spare Spanx, and replacement heels in case I break one of mine running to whatever meeting I’m late to this time? What about an onboard GPS system that won’t let me make hormonal navigation decisions? Or an OnStar system that summons only the cute AAA guy? And I’d really love a specialized Breathalyzer that can detect if I have too few Skinnygirl Margaritas in my system to go home with that guy. To be fair, Honda is providing a UV-blocking windshield to stave off every girl’s first face lift. But really, if you’re not going to make the glove compartment heart-shaped and give me a makeup mirror in the driver’s-side visor, how can you claim to be meeting my needs? And forget a cigarette-lighter adapter. I want to be able to plug my mini touch flat iron right into the dash. I’d prefer a seat back that mimics a hot stone massage, but I understand if Honda wants to keep that as an optional upgrade—some of my friends prefer Swedish techniques. If Honda’s willing to make these changes, I might be willing to consider the She’s when it’s rolled out in the United States. A special seatbelt for my lap dog would cinch the deal.